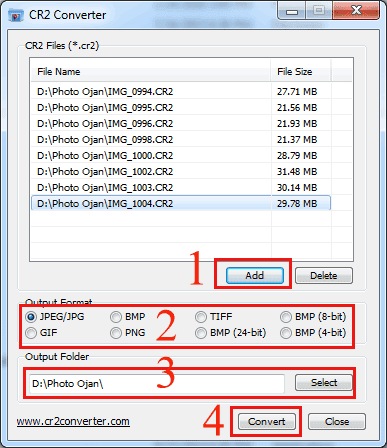 In this article I want to share a few tips about how to convert images with CR2 format to JPEG using the free CR2 Converter Application. I wrote this tutorial from the request of a friend who has a photo snap Canon DSLR camera with CR2 format. He wants to convert the CR2 format into JPEG, in order to be opened on the computer. After searching for some literature, I think this is the best way to do because it is faster and easier. CR2 (Canon Raw Version 2) is a digital RAW photography format created by Canon Inc. Is is one of the raw image files that can store all original image information without image processing, making it an excellent format for all professional photographers or photography enthusiasts. RAW files retain all the details and photo information so that the file size is much larger than the JPG / JPEG image file. CR2 Converter is free converter software for CR2 format (Canon RAW version 2). This software can be used to convert CR2 format images or CRW image files to common image formats, such as JPEG / JPG, GIF, BMP, BMP or TIFF format. If you Interested to tray it, please download it from the available link at the end of this post. This software supports batch conversion, so you can add multiple digital photos at once, and convert them together. No setting is too complicated and there are no complex operations. This software is very simple and easy to use. If you are a user Canon SLR Digital Camera, this is a very useful software for your daily life, because it can easily help you to solve problems like "how to convert CR2 to jpg" or similar needs. Select Add button to insert photo file with CR2 format, you can do it one by one or directly insert multiple photos at once. Press the Convert Button to start Converting CR2 Image to JPEG. The length of the convert process depends on the number of files and the size of the image is converted.